In 2002 the Bush administration completed a Nuclear Posture Review that introduced a ‘new triad’ based on offensive-strike systems, defences and a revitalized defence infrastructure. The new triad is designed for a new strategic threat environment, characterized not by a long-standing nuclear rivalry with another superpower, but by unstable relationships with rogue-state proliferators, alongside more ambiguous relations with nuclear-weapon powers. 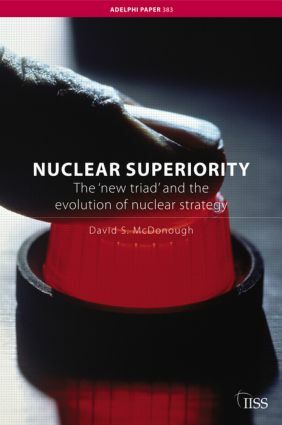 Providing a historical context to these modifications to US nuclear strategy, Nuclear Superiority details how the new triad, which strongly emphasizes the need to bolster the credibility of the nuclear deterrent and to prepare for nuclear use when deterrence fails, is founded on previous efforts to secure nuclear superiority against the Soviet Union and counter-proliferation capabilities against WMD-proliferant adversaries. It illustrates how the evolution of American nuclear strategy towards more effective counter-force capabilities, regardless of the current threat environment, has led to a host of counter-force developments. David S. McDonough explores how this strategy is based on the long-standing American desire to control conflict escalation and how it may invite crisis instability with regional adversaries and disquiet among established nuclear powers.